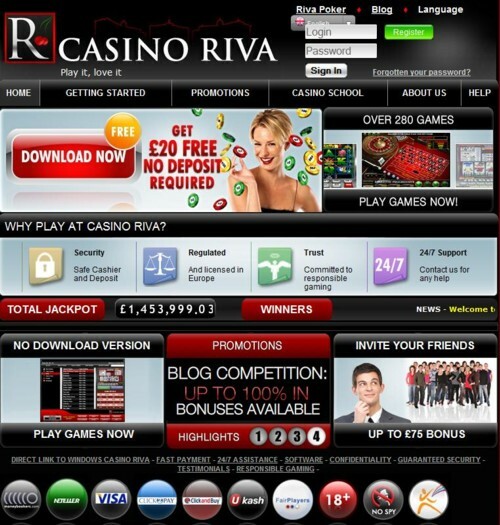 One of Europe’s leading online gambling companies is Casino Riva. This online casino has been online since 2007 and became a benchmark in the market, with a recent site facelift. Casino Riva offers high end casino gaming experience to players in ten different languages such as English, French and Spanish. This online casino is licensed in Malta and follows the strict policies and procedures that are issued by the Lotteries and Gaming Authority. Casino Riva’s game range from Slot machines to American roulette with over 280 different types of games. The slot machines at Casino Riva have up to 20 lines available, games that have progressive jackpots which have most times offer big prizes. Casino Riva has made it very easy and uncomplicated to deposit and start playing their games. Players can choose from the many options of deposit methods: Bank Wire Transfer, Bank Draft/Cheque, CLICK2PAY, ClickandBuy, MasterCard, Moneybookers, NETELLER, and Visa. Casino Riva excepts North American players but not US Players. Casino Riva uses Fast-CPU software which is owned by Cosmo Gaming Company and is licensed in Malta; Fast-CPU also supports the ability for players to place a wager without downloading the software. Casino Riva has been recognized and approved by Fairplayer, which is an official company to assure casino players that the casino is in good standing, secure, honest and totally transparent. When it comes to the promotions and bonuses at Casino Riva there really needs to be a separate review written as there is quite a range of prizes, bonuses and promotions available. 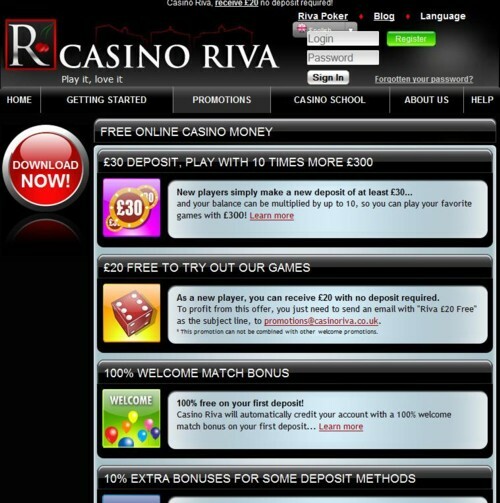 Firstly Casino Riva is giving a £20 bonus with no deposit required. In order to be eligible for this you need to email promotions@casinoriva.co.uk with “Riva £20 Free” in the subject line. There is also a 100% welcome match bonus up to £500, reload bonuses of 10%, Fidelity Points where you can then become a VIP player who will profit from a lot more offers and promotions. Casino Riva also runs monthly random draws and offers £75 per friend that players refer. Casino Riva’s customer service department is unrivalled. This online casino offers communications via telephone, fax and post and players can email at anytime getting a response within 30 minutes from a real person not an automated response.